Jennifer's career includes competitive experience at the highest levels of amateur and professional golf, making her playing experience one of the best in British Columbia. She earned a scholarship at the University of Washington, where she then pursued over ten years of tour experience, including two years on the LPGA Tour. She was the 2010 Washington State Women's Open Champion, and the 2010 CN Canadian Women's Tour Low Teaching Professional of the Year. Jennifer is now a member of the LPGA Teaching & Club Pro Division, and is a certified TPI Instructor. 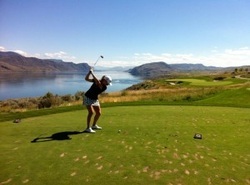 She is committed to providing the best golf instruction and programs in the Fraser Valley. Tom MacIsaac, Sardis Golf Academy Coordinator, TPI Trained Instructor. Tom is a Biology teacher at Sardis Secondary and an instructor at the Sardis Golf Academy. Tom grew up in Nova Scotia where he played CIS Hockey with St. Francis Xavier University while completing his B.Sc. in Biology. Tom also played Senior ‘A’ hockey in NS and NB before moving to Chilliwack to start his teaching career. Tom is currently a coach in Chilliwack Minor Hockey and coach of the Sardis Secondary Golf Team. Lindsay Manion developed a passion for the game of golf during her high school years. Lindsay was a proud member of UBC women’s golf program for 3 seasons. During her run at UBC, she proved herself a leader acting as the team’s fitness captain. She helped lead the team to three straight RCGA National Championships and one NAIA National Championship. Lindsay graduated in May 2011 with a bachelor of Human Kinetics. Lindsay has a diverse athletic background. Lindsay’s experience in soccer, hockey, basketball and other sports has given her a unique perspective on athletic development. Lindsay has also been featured in two golf fitness DVD’s Loaded: Explosive Rotational Power (2011) and The Experiment (2012). Lindsay now looks to utilize her knowledge of golf and training to help others on their road to competition.